Walk, shop, dine, enjoy festivals and parades! Downtown Indiana works to have a broadly supported and coordinated development plan for the heart of the community by addressing economic development, land use, infrastructure, health, education, culture, recreation, historic preservation, tourism, safety and quality of life issues in order to form a vibrant and healthy heart by the community. We have country furniture, primitive decor & outdoor polywood furniture.? We're nestled in the country and give tourists a taste of the country life. We're open Thursday, Friday and Saturday from 10:00 AM - 5:00 PM. Dried flowers, primitives, wreaths, swags, baskets, and country crafts. 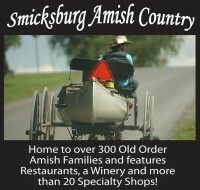 Open Monday through Saturday from 10 a.m. to 5 p.m. and Sundays from 12 noon to 5 p.m.
Local business organization for area shops in the Smicksburg Amish area that promotes a unique shopping and dining experience. The Artists Hand Gallery's mission is to showcase and bring to market the artwork of our local artists and artisans. 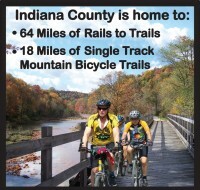 It is part of a community outreach, in conjunction with the Indiana Arts Council, to bring performing arts and educational opportunities to the people of Indiana County. We offer workshops for children and adults that focus on the creative process and personal expression. We are known for our fun paint sessions. Our sessions are held in the keeping room of the historic James Campbell House. We also offer local art in our gift shop. William and Mary Gift Shoppe Inc.
Open Monday - Saturday 10 am to 5pm Unique cards and gifts including Trollbeads, Stonewall Kitchen, Sorrelli Jewelery, Vintage frames and more. 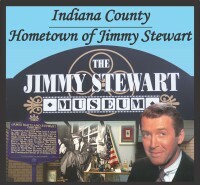 A must see in downtown Indiana! We are an authentic Amish House that utilizes the old world styles for lighting and heating while displaying endless items that are handmade, antique, and vintage. We also utilize the authentic Amish kitchen to make homemade food items. Located in the heart of downtown Indiana, PA, the 700 Shop has been satisfying customers for over 50 years. Specializing in menswear of all sizes, the 700 Shop is committed to making you look and feel your best. Be it for a day at the office, an afternoon on the golf course, or your wedding day, the 700 Shop caters to your needs as an individual for any and every occasion. When looking for sportswear, casual-wear or business and formal attire, the 700 Shops wide selection of inventory, paired with on-site tailoring, provides a head to toe one stop shop. Owner Josh Rosenberger, and the 700 Shop's team of experienced and professional consultants are ready to assist with any of your clothing needs to ensure fashion and fit. Trusting in high quality brands such as S.Cohen, Talia, Ralph Lauren and Calvin Klein, The 700 Shop also offers custom suits and tuxedo rentals for all of your business or formal needs. Looking for tried and true sportswear brands? The 700 Shop is a proud retailer of The North Face, Columbia, Nike, Callaway and Greg Norman, with inventory including shorts, polos, hoodies, shirts and a variety of winter coats and jackets for everyone in the family, including extended men's sizes, and even women's and children's merchandise. Shopping for casual-wear has never been easier than at the 700 Shop with a wide selection of items from Levi and Nautica. We even stock shoes from quality companies such as Johnston & Murphy, Hush Puppies, Rockport and Florsheim. If your needs aren't met by the impressive selection of inventory in stock, the 700 Shop also offers custom orders on an endless array of merchandise and accessories. Stop in today to see what the 700 Shop can do for you. Friday 10:00 AM - 6:00 PM Saturday:10:00 AM - 4:00 PM Closed Sunday Resale of quality used read wood furniture, antiques, collectibles, oddities and rarities taking you back in time and having fun with customers. Bridal Shop - Mon thru Fri - 10:00 AM - 5:00 PM / Wed 10:00 AM - 7:00 PM / Sat 9:00 AM - 3:00 PM Bridal Gowns, Tux Rentals, Maids, Mothers, Special Occasions, Prom, Homecoming, Flower girls, Invitations, Decor & Linen Rentals.